In 1999, Apollo 13 Commander Jim Lovell and his family opened a steakhouse in the northern suburbs of Chicago: Lovells of Lake Forest. I'd been wanting to try it out since reading Elizabeth Howell's review over at Universe Today a few months ago. So the boyfriend and I went a few weeks ago to celebrate my birthday, and it was a space nerd's dream come true. 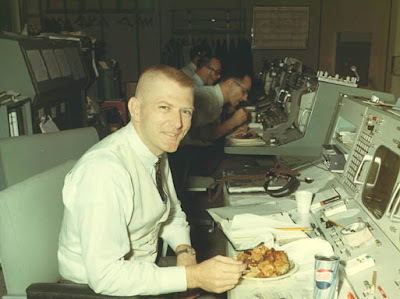 Gene Kranz, lead flight director during Apollo 13, chows down. The restaurant is full of Apollo and Gemini memorabilia, including a giant mural called Steeds of Apollo, painted by Luman Winter in 1969 for the St. Regis Hotel in New York City. The hotel auctioned the painting off when remodeling a few decades later. The Lovells wanted to buy it, but were outbid. Turns out that a family friend, Tom Hanks (a.k.a., Commander Lovell in Apollo 13!) had put in the winning bid, to give the mural to them as a present! Now, it hangs behind the bar in the restaurant. The Steeds of Apollo, at Lovells of Lake Forest. Our meal was delicious- I had pasta and a Greek salad; the boyfriend had a rack of lamb. For dessert I ate cheesecake and he had crème brûlée. Oh, and I had a "heatshield martini" - basically a Bloody Mary, but with an outer space themed name! 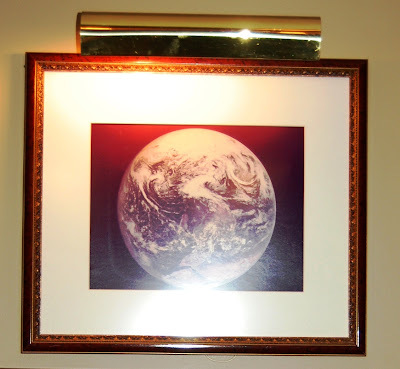 The Earth from Apollo 17, at Lovells of Lake Forest. 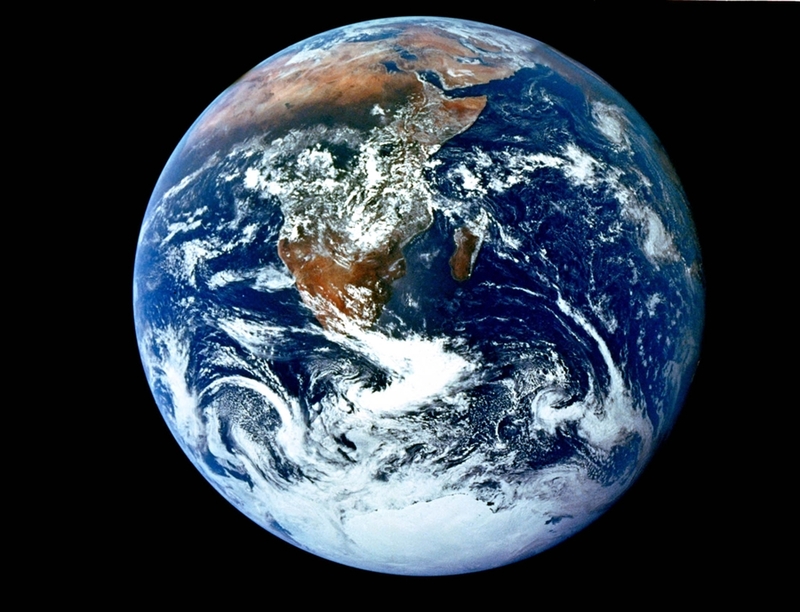 The Earth from Space, viewed by the Apollo 17 crew. 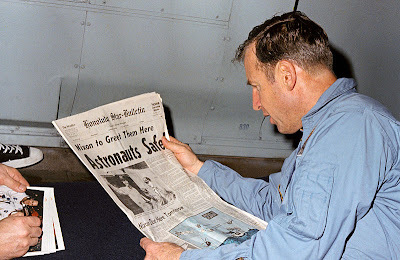 Commander Lovell reads about his safe return, after the fact. The tow truck prank is a goofy footnote to Apollo 13's amazing story. Moon-bound Apollo spacecraft were comprised of three main parts: service, command, and lunar modules. A little over two days into John Lovell, Jack Swigert, and Fred Haise's trip to the Fra Maru highlands, an oxygen tank exploded in the spacecraft's service module, severely crippling it. This left the command module without adequate oxygen and power for the duration of the trip back to Earth. So, the three men powered down the command module and defunct service module, slingshotting around the moon in the lunar module, with the command module and crippled service module attached. Once they returned to Earth, Lovell, Swigert, and Haise jettisoned the lunar modules and service modules and descended in the command module. Effectively, the lunar module served as their lifeboat for the period of time between the explosion and when they re-entered the Earth's atmosphere. 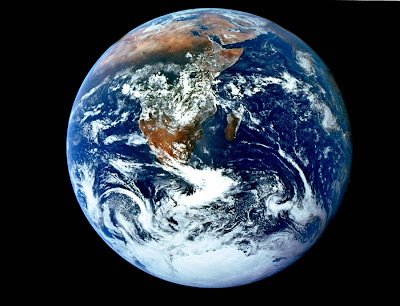 Without it, there would have been zero chance for a safe return to Earth. The lunar module was so helpful because its systems (of course) have to be able to operate independently of the command module and service module. With some creative fixes stretching out resources meant for a shorter trip to the moon for two men, it had enough power and supplies to keep the three men pressurized, warm enough (they were still very chilly), and breathing during their voyage home. 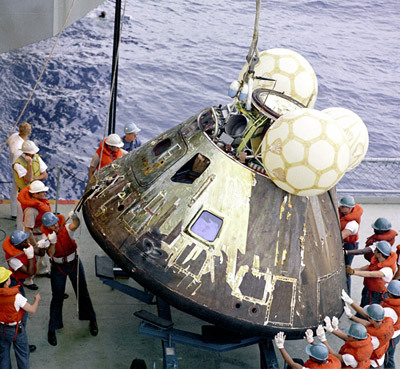 A view of the damaged Apollo 13 service module. The instrumentation on the right side shouldn't be visible: the explosion blew the panels off the side of the craft. All of the Apollo lunar modules were built by a private contractor, Grumman Aerospace. The service modules and command modules were built by a different contractor, North American Aerospace. No doubt Grumman staff were very proud of the lunar module's critical role in rescuing the Apollo 13 crew... and following Apollo 13's safe landing, a few Grumman employees pulled a prank: invoicing North American for the cost of towing the command module and service module back to Earth! 400,001 miles at a cost of $4.00 for the first mile and $1.00 for each additional mile, adding up to a total of $400,004. Jumping the command module's batteries prior to reentry: $4.05. 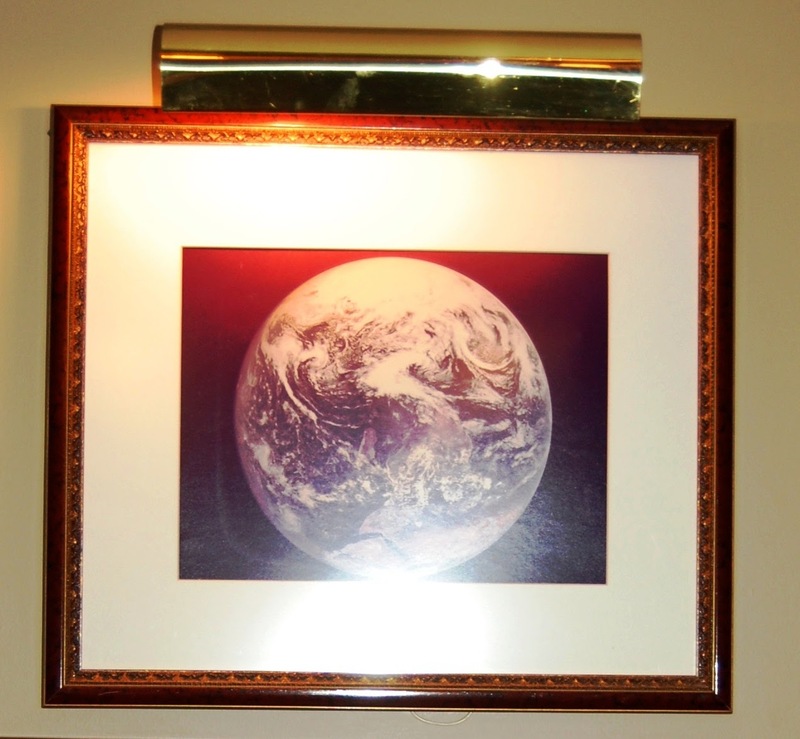 $10.00 per pound for 50 pounds lunar module oxygen: $500.00. $8.00/night for 4 night stay by an unexpected guest, Fred Haises, who should have been orbiting the moon during the lunar module's trip to the surface: $32.00. (Note: the invoice lists a check-out time of noon on April 17th, 1970). The total cost, with discounts, added up to $312,421.24. The staff of Grumman's Flight Control Integration Lab was responsible for writing up the invoice. Their joke was leaked by Sam Greenberg, a Grumman employee who was fired for his trouble... and then personally reinstated a couple hours later by Grumman's president, Lou Evans. North American responded to the prank with a press conference. 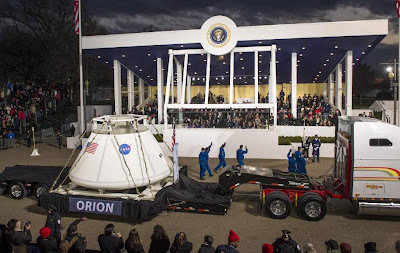 They demanded payment from Grumman for the command module and service module's role in towing lunar modules to the moon during Apollo 10, 11, and 12! 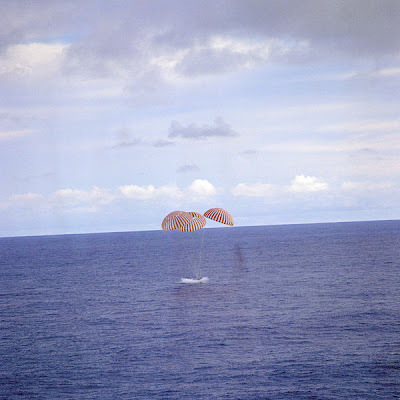 The Apollo 13's command module splashes down. Sources: Lovells of Lake Forest; Everything2.com; Sarah's Geek Blog; Wikipedia. Note: Speaking of Gene Kranz and Apollo 13, I finished Kranz's autobiography, Failure is not an Option, a few weeks ago. I highly recommend it! He's got the inside scoop on decades worth of NASA missions, and he's a friendly and thorough narrator. In the history of manned spaceflight, there have been only two high-altitude rocket accidents. In 1986, an o-ring seal failed at launch, allowing pressurized gas to escape one of Challengers's solid rocket boosters. The leak compromised the integrity of the solid rocket booster and the external fuel tank. Challenger, its rockets, and the fuel tank broke apart just 73 second after launch. All seven astronauts aboard died. Challenger's last flight, moments after lift-off. The crew of Soyuz 18a, Cosmonauts Oleg Markov and Vasili Lazarev, experienced the other high-altitude rocket accident in April 1975. 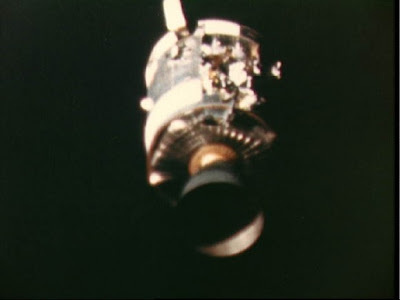 Less than five minutes into their flight to Salyut 4 (one of the Soviet Union's early space stations) the second stage of the craft's rocket failed to fully separate from the third stage. The third stage fired with the second still attached, straining the booster and causing the Soyuz to fly off course. This triggered an automatic abort, detaching the launch/re-entry capsule from the service module, orbital module, and rocket, and sending the capsule straight back down to Earth. An abort early in Soyuz flight is a rough ride under ideal conditions. Typically cosmonauts would experience 15Gs on their ride back to Earth. But Soyuz 18a's capsule was pointed straight down at Earth when the abort was triggered, making the descent even more severe. During the worst of it, the two cosmonauts experienced 21.3 Gs (which I wouldn't have thought survivable...). Amazingly, both men lived through the G-forces, the parachute worked, and the capsule landed in one piece. The G-forces were enough to break their ribs, though, and Lazarev in particular was pretty badly hurt. 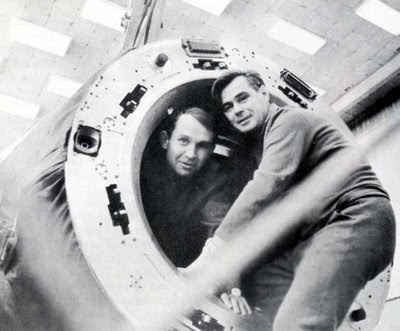 Markov went on to fly in space again several more times after Soyuz 18a, but Lazarev never did. A Soyuz being transported to the launch pad. 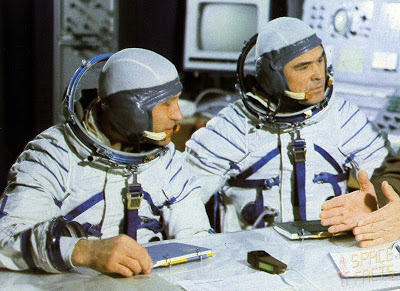 If its flight to Salyut 4 had gone as planned, Soyuz 18a's crew would have spent 60 days in space and then landed on the empty plains of central Kazakhstan. The aborted mission ended up landing hundreds miles further west than this intended target, though. 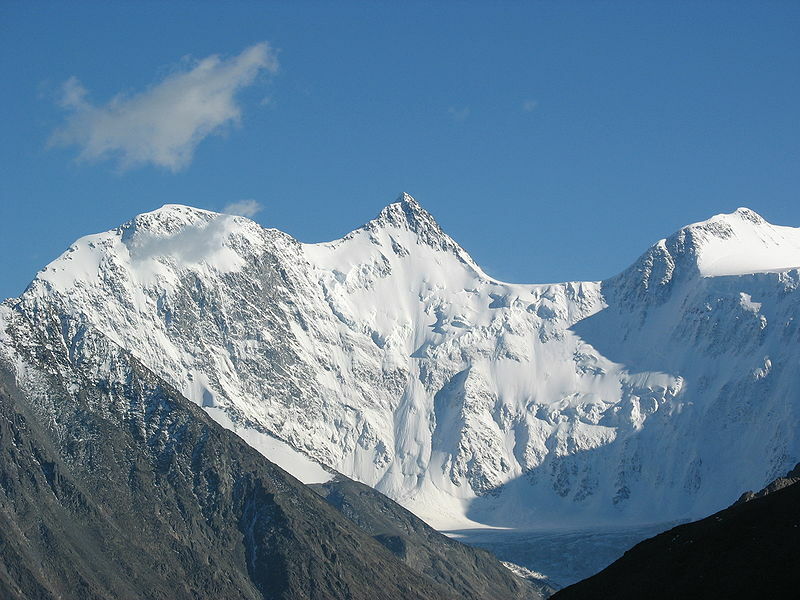 The capsule impacted on a snowy mountainside in the Altai Range. It had fallen 90 miles in about 15 minutes, and Sir Isaac Newton wasn't quite done yet. Upon landing, the barrel-shaped spacecraft began to roll down the mountainside! Luckily, its parachutes got snagged on surrounding trees; otherwise Soyuz 18a it would have rolled right off a 500 foot cliff that was just downhill from the spacecraft's impact site! Even though the spacecraft came to a stop, the danger wasn't quite over yet. The wildly off-course flight could have landed Soyuz 18a in Western China instead of Eastern Kazakhstan. That would mean trouble for Markov and Lazarev. In 1975, Sino-Soviet relations were icy. The cosmonauts would most likely have been imprisoned by the Chinese government. Markov later recalled that the injured crew was joined after landing by curious folks from a nearby village who'd seen the capsule parachuting down. He knew they were finally safe when he heard the approaching crowd shouting at them in Russian, not Chinese. Soyuz 18a stop short of plummeting down a cliff, and stopped short of crossing the Chinese border. A view of the Alati Mountain Range. A few months ago I wrote about another Soyuz mission that encountered high drama after landing. But I don't want to give the impression that Soyuz spacecraft are particularly dangerous- they've flown over a hundred times, and haven't experienced a fatal accident in over 40 years! Launching and falling to Earth in a capsule has proven safer than flying in a shuttle. 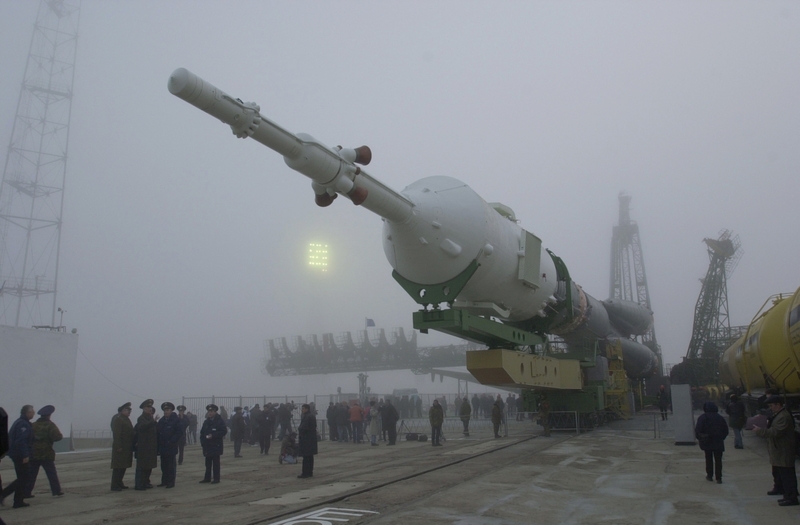 A serious rocket accident during a Soyuz launch may well be survivable, since each Soyuz has a launch abort system. A rocket accident during a space shuttle launch would not be survivable. Even with the escape system added to shuttles after Challenger, astronauts could only survive bailing out of the shuttle during a controlled glide below 50,000 feet and travelling slower than 230 miles per hour. Good thing NASA's replacement for the space shuttle is a capsule, featuring a launch abort system! Orion on parade, during the 2013 inaugural festivities! Sources: Christ Jones, Too Far From Home; The Once and Future Moon; Wikipedia; CollectSpace.